At 15 percent, Chinese automotive tariffs will still be six times higher than what the U.S. charges on almost all vehicles. China is slashing tariffs on imported passenger vehicles, cutting the tax from 25 percent to 15 percent in response to increasing trade pressures from President Donald Trump and his trade advisors — but that tax is still six times higher than what the U.S. assesses on imported cars, and Trump said he is "not satisfied" with the trade talks, telling White House reporters Tuesday that the negotiations were just a start. Trump's comments came as South Korean President Moon Jae-in visited the White House to discuss next month's summit on North Korea. When a car is sent to the United States from China, there is a Tariff to be paid of 2 1/2%. When a car is sent to China from the United States, there is a Tariff to be paid of 25%. Does that sound like free or fair trade. No, it sounds like STUPID TRADE - going on for years! Chinese regulators have been hinting at a reduction in tariffs since last fall, and the move will formalize a promise made by President Xi Jinping earlier this year. But it could be just the first in a series of steps meant to ease trade frictions based on the automotive sector. Regulators there have also suggested they will move away from rules that currently require foreign manufacturers to partner with Chinese automakers in order to set up factories in the country. China is the world’s largest automotive market, with sales rising to about 24 million vehicles in 2017 compared to 17.2 million in the United States. 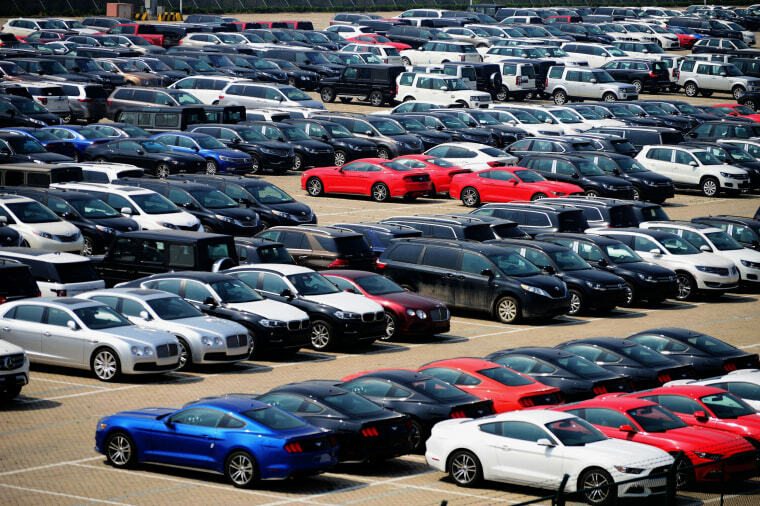 Imports, however, are barely a single-digit share of the Chinese market, with American-made vehicles generating just $10.5 billion in sales in 2017, or around 300,000 vehicles, according to U.S. trade data. That did mark an increase from $8.8 billion in 2016, according to the U.S. Census Bureau, and foreign manufacturers have been hoping to see even bigger gains once tariffs are brought down to levels more in line with what other major markets levy. “Benefits are huge for our business, especially Infiniti,” an executive with Nissan told Reuters, referencing the Japanese automaker’s luxury brand. But not everyone is quite so upbeat. At 15 percent, Chinese automotive tariffs will still be six times higher than what the U.S. charges on almost all vehicles — the exception being imported pickups on which American duties are 25 percent. “I don’t really foresee parts or vehicles being exported to China from here” in large numbers, said David Sullivan, a senior analyst with consulting firm AutoPacific. Even if the tariffs subsequently were cut to a figure closer to what the U.S. levies, Sullivan said most manufacturers would limit exports to China because of the “build-where-you-sell approach” that dominates the industry these days. If anything, some experts anticipate that by lowering tariffs and reducing trade frictions, China is hoping to make it easy for its own domestic manufacturers to achieve a long-sought goal of expanding their markets abroad. Chinese carmakers, including BYD, Great Wall, and Geely have been talking about entering the U.S. market for the past decade but have so far stayed out of the retail automotive sector. Guangzhou-based GAC hopes to become the first to make the jump across the Pacific, setting up a U.S. dealer network that will go into operation in 2019. Even with rising labor costs, producing vehicle parts and components in China remains far cheaper than in markets like the U.S. and Europe, industry experts caution. China also plans to reduce tariffs on automotive parts from the current 8-25 percent to just 6 percent, but how much of an actual impact that will have is uncertain. Even with rising labor costs, producing vehicle parts and components in China remains far cheaper than in markets like the U.S. and Europe, industry experts caution. Where the reduction in automotive tariffs may have their biggest impact is on niche products, Sullivan and other analysts believe. That could include relatively low-volume models that just don’t make economic sense to add a production base in China. But many of those vehicles are luxury products, such as Bentley or Ferrari vehicles, for which buyers are less impacted by existing tariffs. The tariff cuts are nonetheless a big move, but the next challenge will be holding China to a recently announced plan that would no longer require foreign brands like General Motors, Volkswagen and Toyota to create 50 percent joint ventures with Chinese manufacturers such as Shanghai-based SAIC in order to set up manufacturing plants. Such an arrangement means those foreign manufacturers not only have to share profits but they also have to provide technology that, in many cases, domestic Chinese companies are now using in their bid to become global automotive players.